Shiro Cosmetics EXPLODED on to the indie make-up scene sometime last year. Their first collection, based on Pokemon proved very popular with self confessed geeky ladies reminiscing about collecting cards and old school video games. Me? I don't give a crap about geekery. Show me pretty colours and I'm there. I was very impressed that Shiro have such a low flat rate shipping cost for international buyers. I think that's the least I've ever paid when ordering from a US company! Everything arrived in a 'bubble mailer' (that's a jiffy bag, to us British folk, but 'bubble mailer' sounds 10x cuter, right? ), with my items in a cellophane gift bag. Three free, cleverly chosen samples and some chocolates - which miraculously made it to the photographing stage - were also included. I ordered one of the mini eyeshadow sets, for which I received five jars containing 1g of product for $13.50. You pick your own colours and add your choices to the 'notes to seller' section as you check out on Etsy. I think this is an excellent option for those of us who can't hack fiddling with sample baggies but don't want to buy full sizes yet. 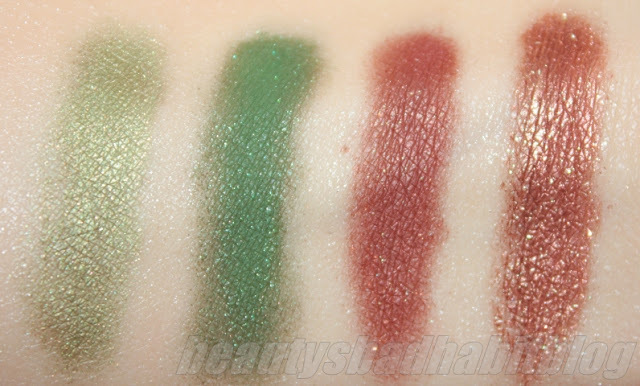 The eyeshadows themselves are extremely well pigmented with a fantastic texture, making them easy to blend and apply. The eyeshadow jars contain sifters with clear plastic labels over the shaker holes. I'm usually not a fan of sifters, but I've found that 1g jars often have loose lids so I was grateful for them for once! 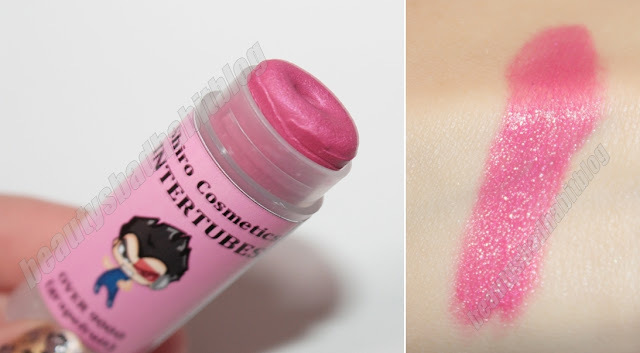 Labels are plain white with easy to read text, containing the company name, eyeshadow name, ingredients and whether or not the product is lip safe. Everything you could want to know in a simple layout - fantastic! I also ordered one of the 'Intertubes' ($6.50), according to the listing each shade differs so much that they can't really be anchored down to being called one type of product (balm, stain, gloss etc). I chose 'Over 9000', a vivid pink with a touch of red. I had a moment of dread after I ordered it to see that it was grapefruit flavour, I loathe grapefruit so imagined handing this straight over to my mother. However, to my relief, it actually tastes like absolutely nothing, just has a slight fruity scent. I found 'Over 9000' slightly gritty, though it applies evenly and feels comfortable on the lips. Overall, I am super impressed with everything I bought and the service I received. 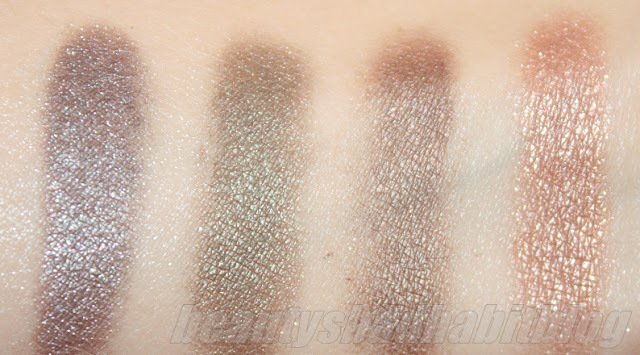 I love the texture of the eyeshadows, shipping was super cheap, free samples were thoughtfully chosen and I now have my eye on another 'Intertube' - I will most certainly place an order with Shiro future! :D I've had my eyes on pretty much ALL of the intertubes!!! 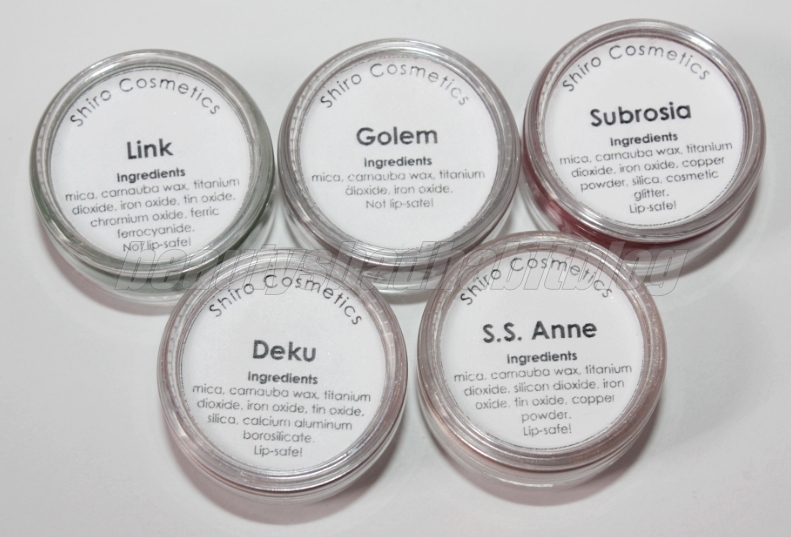 I love Shiro eye shadows. My fav is Sudowoodo, Golem, and Small Key. Your swatches are great! I'm not sure why mine came out so craptastic in comparison. I've yet to try their Interlubes though. 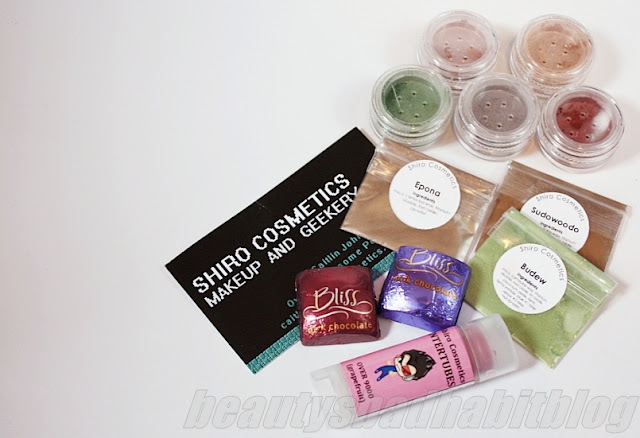 Ahhh I just love Shiro - Caitlin is awesome and her products are just always fabulous! Oh my gosh. I love how they've named everything after video games and anime XD! That Intertube with Vegeta on it takes me back to middle school LOL. I still haven't ordered from Shiro. I know a lot of people are raving about Caitlin's products, but I guess I just haven't got on board because I'm not into the "geekery" theme. But the colors and products do look amazing! Thanks for your review! I really would like to try more of their shadows, I really liked the two samples I got when I bought some Intertubes. I need Over 9000 now! Shiro makes some fab colors! Glad you got to try them! Hahaha, I LOVE that some of the colours are Legend of Zelda themed :D Best video game series ever, in my opinion. Give me makeup AND Zelda and I'm all over it. :D! @ Super Radioactive Girl, they are ace, try them out when you have some spare cash! @ Emily, agreed and agreed! @ Risha, everything is super pretty, loving SS Anne. @ Love, B, I haven't a clue about gaming or anime but I know plenty of people have bought them just for the names! @ The Peach, I'm not into the geek theme either but all the swatches made me want to buy anyway! @ Konni, wish I could appreciate the geek theme! @ Robyn, the shadows are amaaazing. Love the texture.